Our red plenum solid shielded Cat6 Ethernet cable is used for networking and phone infrastructure, and comes on a convenient spool. 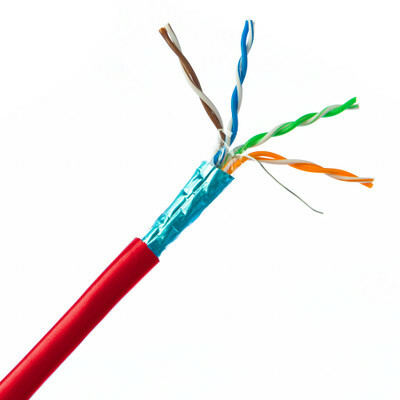 Cat6 cable is used in network applications and has been designed specifically for Gigabit Ethernet applications. They perform at high-data transfer rates, and work with ATM and gigabit speed products. Our Cat6 Ethernet cable exceeds the EIA/TIA-568-C standard. In a typical residential environment, an in-wall rated cable will suffice. However, commercial installations of cabling will have more requirements. In commercial buildings, there will be an area between floors or above office areas for heating/cooling airflow called the plenum. If an office were to catch fire, this plenum area could easily allow the spread of the fire to more floors or across the entire building. Cables that do not have a jacket rated for in wall or plenum use could actually cause the fire to become more intense. Plenum rated cables are jacketed with a fire-retardant plastic jacket of either a low-smoke polyvinyl chloride (PVC) or a fluorinated ethylene polymer (FEP) for less toxicity during a fire. If a fire gets into a plenum rated area that contains plenum rated cables and the fire spreads, the cables will not be to blame. Plenum rated cables can help prevent the spread of fires, but keep in mind that a Plenum rated cable will have no data transmission speed benefit over a non-plenum rated cable. Please note that due to the thickness of this cable, no male connectors will fit. This cable is intended to be punched down in a keystone jack, or into a patch panel.